Copper has been associated with health benefits including proper growth of the body, efficient utilization of iron, proper enzymatic reactions and improved health of connective tissues, hair and eyes. This micronutrient plays an important role in supporting bone mineralization, connective tissue health, red blood cell production, cardiovascular function and neurological health. 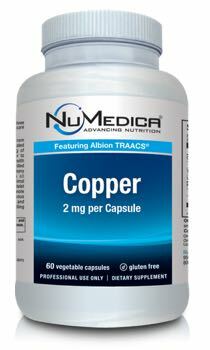 Additionally, copper has been found to help neutralize free-radicals and stimulate the immune system. Copper is not produced naturally in the body and must therefore come from external food sources including meat, seafood nuts, avocado, beans, whole grains and others. Performs essential metabolic functions in the body. 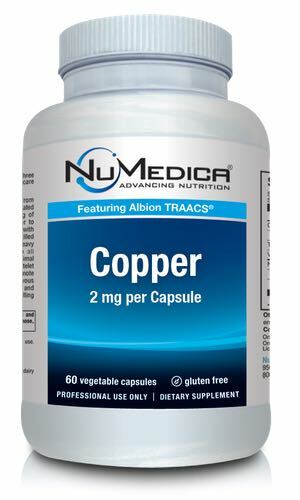 NuMedica Copper - 60c 1 Capsule 60 Take one capsule per day or as directed by your healthcare practitioner.